AP Diploma in Hotel Management,Catering Technology(HM& CT) Admissions 2017, Three Year Diploma course in Hotel Management,Catering Technology(HM& CT), DTE AP Admission Notification 2017, SBTET AP Admission Notification 2017. 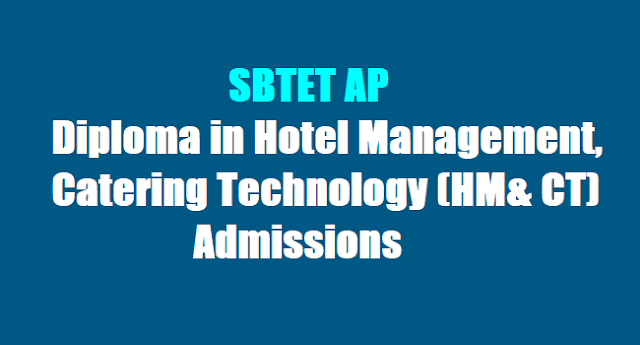 AP Diploma in Hotel Management,Catering Technology(HM& CT) Admissions Notification 2017: Government of AP, Department of Technical Education has published the AP Diploma in Hotel Management, Catering Technology(HM& CT) Admissions 2017 Notification on 21-06-2017 for admission into 3 year Diploma in Hotel Management,Catering Technology Course and Applications are invited from eligible candidates from the AP State for above said courses admissions offered at the institutions under the control of the Department of Technical Education, Govt. of AP.